Siemens Stiftung committed itself to building locally driven, globally connected communities of social entrepreneurs and supportive infrastructure across Africa that may also serve as a delivery platform for Siemens Stiftung’s key programs in the region. One of the key programs developed is the Makerspace initiative. A makerspace is a 21st-century digitally-connected community workshop and lab open to entrepreneurs and people in general who are interested in learning, designing and making together in a collaborative environment. Typical equipment ranges from low- to high-tech, but spans 3D printers, laser cutters, CNC machines (e.g. routers, mills, lathes), sewing machines, soldering irons and electronics tool kits. Makerspaces help people gain skills through learning-by-doing: using CAD/CAM software to apply 3D modelling, 3D printing, coding, robotics, carpentry, metalwork and other tools for rapid prototyping of physical objects and hardware. Makerspaces complement Science, Technology, Engineering, Art and Math (STEAM) fields and support entrepreneurship through new product development. 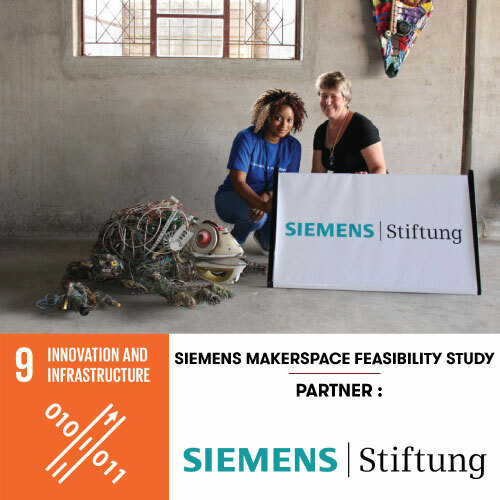 At the beginning of February 2017, Impact Hub Harare in partnership with Siemens Stiftung took part in a feasibility study that was to determine whether it was favourable to build a Makerspace in Harare. The feasibility study lasted a period of 6 months, from the beginning of February 2017 to the end of July 2017. This study led to the incubation of 3 prototypes by two makers. One of the prototypes by The Maker Club is a model of a sustainable city, running on green energy. Impact Hub Harare is exploring the long- term vision of building a Makerspace in Harare.